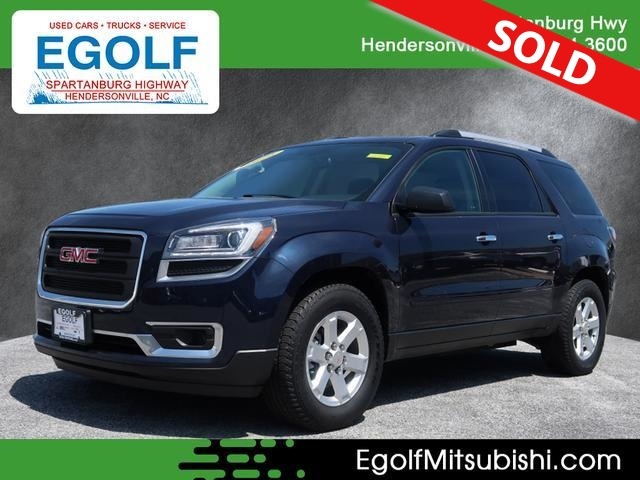 2016 GMC ACADIA SLE, AWD, ONE OWNER, CLEAN AUTOCHECK HISTORY REPORT, LOW MILES, AUTOMATIC TRANSMISSION, THIRD ROW SEATING AND MUCH MORE. PLEASE CONTACT EGOLF MITSUBISHI SALES AND SERVICE @ 828-694-3600 FOR MORE INFORMATION AND TO SCHEDULE YOUR TEST DRIVE TODAY @ 1325 SPARTANBURG HIGHWAY, HENDERSONVILLE NC 28792. FINANCING AVAILABLE FOR ALL CREDIT TYPES!!. The 2016 GMC Acadia remains one of our top picks among three-row family crossovers, with class-leading cargo room, generous passenger space and a comfortable ride. Sluggish performance and antiquated interior controls betray its advanced age, however. The GMC Acadia's OnStar system gets standard 4G LTE WiFi hotspot capability for 2016. Compliant ride quality; generous cargo capacity, even behind the third row; seating for up to eight passengers; top crash test scores. It's rare when a car goes longer than six years between full redesigns, yet the GMC Acadia is soldiering into its ninth year since it was first introduced way back in the latter half of the Bush administration. Now, there are ways in which it is metaphorically graying at the temples. But even in the face of all-new and thoroughly impressive competitors, the old lady Acadia remains a highly desirable three-row family crossover. Chiefly, the 2016 GMC Acadia continues to be the most spacious vehicle in its segment (along with its Buick Enclave and Chevy Traverse siblings). It has seatbelts for eight occupants, and even full-size adults can fit comfortably in its third row, a feat that only a few rivals can match. It also boasts more cargo space than everything short of a minivan or Suburban-like jumbo SUV. Its blockier styling gives the GMC Acadia a more commanding road presence than its Enclave and Traverse siblings. Riding in the Acadia also remains quite pleasurable, as the compliant ride quality and quiet cabin make for relatively serene road trips. Driving an Acadia, however, isn't so great. It's true that the Acadia isn't as cumbersome to drive as a traditional SUV like GMC's own Yukon. But compared to some rival three-row crossovers, however, the big and heavy Acadia is harder to maneuver in tight spaces and its acceleration isn't as quick. Some of its dashboard controls are also behind the times. As such, we recommend checking out the newer Honda Pilot and Toyota Highlander. The Dodge Durango, Ford Explorer and Hyundai Santa Fe are also worth a look, as are the Buick Enclave and Chevy Traverse for their variations on styling and interior ambience. However, the elder statesman 2016 GMC Acadia is still a solid pick, particularly if interior room is a priority. An eight-passenger seating configuration with a second-row bench seat is standard on the base SLE-1 and optional on the rest, which have a standard seven-passenger configuration with second-row captain's chairs. The Acadia SLE-1 comes standard with 18-inch alloy wheels, automatic headlights, rear parking sensors, rear privacy glass, roof rails, cruise control, cloth upholstery, a leather-wrapped tilt-and-telescoping steering wheel, Bluetooth phone connectivity, OnStar telematics services (see Safety section for details), a 4G LTE built-in WiFi hotspot, a rearview camera, a touchscreen electronics interface and a six-speaker sound system with a CD player, USB/iPod interface, an auxiliary audio jack and satellite radio. The SLE-2 adds a power liftgate, remote ignition, an additional front-middle airbag, an eight-way power driver seat, two-way power passenger seat (manual recline), an auto-dimming rearview mirror and GMC's upgraded IntelliLink electronics interface. The SLT-1 adds 19-inch wheels, upgraded steering, heated mirrors, tri-zone automatic climate control, leather first- and second-row seats (third row simulated leather), heated front seats, an eight-way power passenger seat, a 10-speaker Bose surround-sound audio system and rear headphone jacks. The SLT-1's Open Road package adds a dual-pane sunroof (stand-alone option on SLE-2 and both SLT trims), towing equipment, forward collision warning, lane-departure warning and a navigation system. The Premium Edition essentially adds 20-inch wheels to the Open Road package. The SLT-2 adds power-folding mirrors, blind-spot warning, rear cross-traffic alert, driver memory functions and a heated steering wheel. The optional Technology package adds xenon headlights, a head-up display and cargo area audio controls. The SLT-2's Open Road Package includes forward collision warning, lane departure warning, heated and cooled front seats, the Technology package items and a navigation system. The Denali includes the Technology and SLT-2 Open Road packages, plus it adds 20-inch wheels, special exterior styling, extra sound-deadening materials, the dual-pane sunroof and a power-adjustable wood-trimmed steering wheel. Although well-appointed, the 2016 GMC Acadia's console design is starting to show its age. The 2016 GMC Acadia is powered by a 3.6-liter V6 engine paired to a six-speed automatic transmission. Output on most trims is 281 horsepower and 266 pound-feet of torque, but the Denali produces 288 hp and 270 lb-ft thanks to an extra exhaust. Front-wheel drive is standard, and all-wheel drive is optional on all trims. In Edmunds performance testing of the related Chevrolet Traverse, we measured a 0-60-mph time of 8.1 seconds with all-wheel drive, which is a bit slow for a large crossover. A Buick Enclave, which shares the Denali's more powerful engine, was actually a half-second slower. Properly equipped, the Acadia can tow up to 5,200 pounds. EPA-estimated fuel economy is 19 mpg combined regardless of whether you get front- or all-wheel drive. The city and highway estimates differ, however, with front-wheel drive achieving 17 city/24 highway and all-wheel drive getting 1 mpg lower in each. Standard safety equipment on the Acadia includes antilock disc brakes, traction and stability control, front seat side-impact airbags, side curtain airbags, a rearview camera and rear parking sensors. All but the SLE-1 also have a front-center airbag that inflates between the driver and right front passenger for additional protection in a side-impact collision. The standard OnStar system includes automatic crash notification, on-demand roadside assistance, an emergency assistance button, stolen vehicle locator and active intervention, and remote door unlock. Forward-collision and lane-departure warning systems are included with the Open Road packages available on the SLT trims. They are standard on the Denali. Blind-spot warning and rear cross-traffic alert are standard on the SLT-2 and Denali; they are optional on the SLT-1. In government crash testing, the 2016 Acadia received a top five-star rating for overall performance, with five stars for total frontal impact safety and five stars for total side impact safety. The Insurance Institute for Highway Safety gave the Acadia the highest possible rating of "Good" in the moderate front overlap, side and roof strength tests. Its seat/head restraint design was also rated "Good" for whiplash protection in rear impacts. The Acadia features an attractive interior, with most of the surfaces you're likely to touch or lean an elbow on padded and of a solid quality. Most three-row vehicles have limited rearward visibility, and the Acadia is no exception. As such, the standard rearview camera is a huge help. Every Acadia comes with a touchscreen electronics interface, which is upgraded with GMC's IntelliLink smartphone integration functions on upper trims. It has a fairly intuitive menu structure, but it can be slow to respond to inputs, and the screen itself is small by current standards. It's also mounted quite low on the dash and its surrounding touch-operated buttons are there to create a high-tech appearance rather than serve an actual functional purpose. In this way, the Acadia's advanced age compared to its rivals is obvious. Front occupants will enjoy abundant head- and legroom, as will most second-row occupants, but the middle row seat cushions are mounted low, reducing comfort for adults. Sliding those seats all the way back alleviates this issue, but effectively kills third-row legroom. Getting to the third row is reasonably easy, with a mechanism that allows the second row to slide farther forward than those of most rivals. The third row is actually roomy enough for two larger adults to fit comfortably (a feat not shared by many competitors or GMC's own Yukon), though it's realistically best suited for those of smaller stature or children. This is especially true if you want to fit three across. As with many three-row crossovers, average-sized adults may have a difficult time sitting in the third row for extended amounts of time. When it comes to cargo space, the Acadia offers more than any crossover apart from its Buick and Chevrolet siblings. There's even a comparatively useful amount of space behind the third row. Really, if this doesn't provide enough cargo room for you, a minivan is your only other choice. The 2016 GMC Acadia is the quintessential American family cruiser, with a comfortable, isolating ride and a quiet cabin that makes summer road trips relatively serene (bickering siblings notwithstanding). At the same time, though, there's no hiding the Acadia's immense dimensions and ample weight. The V6 engine has enough power to get it up to speed on the highway, but it lacks punch and can feel strained during passing maneuvers, especially when full of luggage and passengers. The Acadia can also feel comparatively cumbersome when maneuvering it on tight city streets and in parking lots.